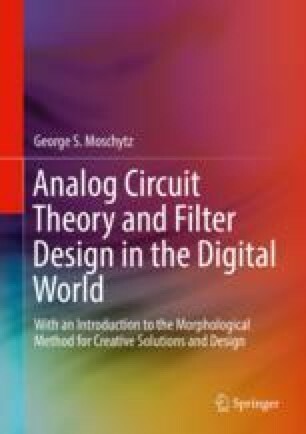 The fact that switched-capacitor (SC) filters were introduced relatively recently into the mainstream field of circuits and systems meant that an actual theory of these networks was lacking and an analysis and synthesis method specifically for these circuits had not yet been developed. Among the earliest methods of analysis developed soon after the appearance of the Hosticka, Broderson, and Grey 1977 paper (see Chap. 17) is the method introduced in this chapter. It consists of essentially breaking up a time-varying bi-phase SC network into two time invariant sub-circuits, i.e., two ports. Each of these corresponds to one of the two clock phases, i.e., “even” and “odd,” of the switches used in an SC circuit. Each sub-circuit permits conventional two-port analysis to be carried out. Because each is valid only in a separate time phase, the two are interconnected by a so-called link two-port (LTP). The LTP replaces the charge storage properties of non-switched, i.e., non-shorted-by-switches, capacitors. Thus, the LTP alternately “links” each two-port with the surrounding circuit in each phase, i.e., even and odd. The two-port of each phase, as well as the link two-port itself, is each independently subject to conventional two-port analysis. Together, we obtain two two-ports, each with an even and odd path from input to output, linked by the LTP. This results in a “four-port” and a “four-port analysis” which yields, with some exceptions, well-known circuit theoretical concepts and analytical properties in the transformed z-domain. Once in the four-port circuit theoretical sphere, further well-known circuit theoretical operations and analysis tools from two-port theory can be adapted to it. This includes analysis with matrices, e.g., the transmission and admittance matrix, and analysis with signal-flow graphs, as discussed in Chap. 20.